“There is no fate but what we make” – the filmmakers behind the fifth entry in the Terminator film series hope to rewrite its fate, after the third and fourth films left most critics and moviegoers cold. Sci-fi fans know the drill – artificially intelligent network Skynet has taken over the world, killing most of earth’s population in the apocalyptic “Judgement Day”. In the future, John Connor (Jason Clarke) leads the resistance against the machines. 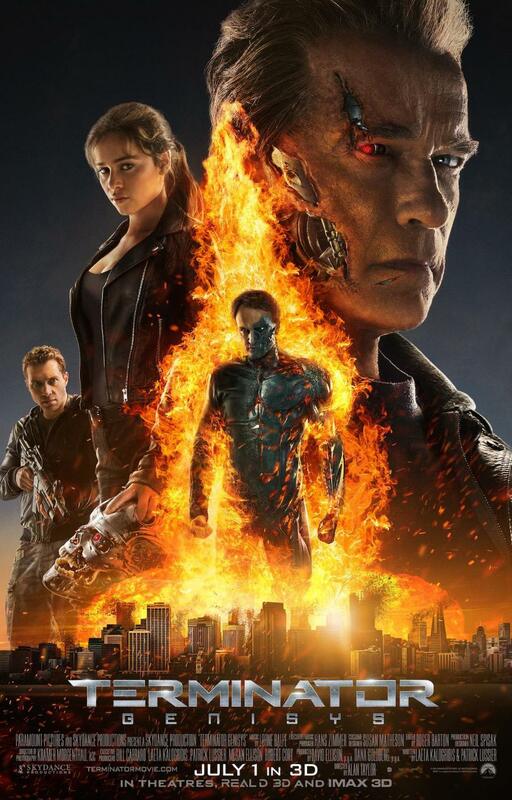 In this reboot, John sends his trusted lieutenant Kyle Reese (Courtney) back in time from 2029 to 1984 to save John’s mother Sarah (Emilia Clarke) from the T-800 Terminator (Schwarzenegger/Brett Azar/Aaron V. Williamson). Kyle arrives in the past to discover he has entered an alternate timeline where Sarah Connor already knows her destiny and has been watched over by an aging T-800 she has nicknamed “Pops” (also Schwarzenegger). Forced to team up with Sarah and Pops, Kyle has to figure out what this means for the future as Skynet takes on a new form; the universal connectivity app “Genisys”. 2015 has already seen the release of new Mad Max and Jurassic Park films, with the seventh Star Wars movie due in December. We won’t be griping about the prevalence of sequels and reboots, because those can be good – it seems the problem isn’t so much that Hollywood has run out of ideas but that studio executives are banking too much on brand recognition and the built-in audience a pre-existing intellectual property brings with it. Terminator Genisys is caught in a paradox: one won’t be able to fully grasp its place in the larger Terminator mythos without having seen the earlier films, but if one holds the first two movies very dear, it’s likely to be a considerable disappointment. The “alternate timeline” route, not unlike with the 2009 Star Trek reboot, seems like a reasonable premise for a series built on time travel. However, the directions that Laeta Kalogridis and Patrick Lussier’s screenplay takes this in often feel like desperate attempts to stretch out a series that should have ended with 1991’s T2 (or at least the theme park attraction T2: 3D Battle Across Time). Judgement Day is postponed – again – and our protagonists have to stop this new Judgement Day from happening – again. The film is comparable to a greatest hits album as sung by a cover band – it’s trying its darndest to add something to the existing material but often feels perfunctory in having to hit those certain iconic waypoints along the way. Genisys actually does a fine job of setting up its fairly convoluted back-story in its opening minutes – we’re told in relatively concise fashion what Skynet is, what happened on Judgement Day, who John Connor is, why Kyle Reese needs to be sent back in time and what the scope of the threat is. Even then, more than a passing familiarity with T1 and 2 is needed for all of it to make proper sense. There’s also the matter of the spectacle – sure, there are plenty of action set pieces and there is some cool new imagery, particularly during a scene involving a MRI scanner, but none of it is truly awe-inspiring or unique. The first two Terminator films, T2 in particular, broke a lot of ground in the realm of special and visual effects and packed in jaw-dropping moments that still hold up today. There is a marked over-reliance on computer-generated imagery and yes, while this is a series about robots, it all feels too synthetic. There’s a helicopter chase that looks entirely like it belongs in a video game and the T-1000’s (Lee) liquid metal effects are on about the same level as those in T2 24 years ago. Arnold Schwarzenegger’s return to the iconic role of the T-800 does lend some legitimacy to the enterprise but we’re sure some fans will find it difficult to accept that the lethal killing machine is now relegated to a softer father figure and often functions as the comic relief. Schwarzenegger still possesses the chops to pull off the action beats and is still a believable badass. However, we don’t get anything half as heart-rending as the bond between the T-800 and a young John Connor in T2, even when the Terminator is supposed to have practically raised Sarah since she was a little girl. At times, this reviewer felt like he was watching a lavishly-produced fan film that had managed to snag an actor from the original show, akin to how Walter Koenig, Nichelle Nichols and George Takei sometimes make appearances in Star Trek fan productions. What makes it all the more difficult for this to be accepted as a proper Terminator continuation is that while Arnie is a recognisable holdover from the earlier films, all the other re-imagined characters look and feel so different than how we know them. Emilia Clarke goes from being the Mother of Dragons to the mother of humanity’s last hope. She is miscast as Sarah Connor, largely unconvincing as a badass woman who has spent most of her life under the tutelage of a purpose-built killing machine. When compared to how intense Linda Hamilton was in the role, Emilia Clarke seems like she’s merely playing dress-up, whiny rather than burdened with the fate of the human race. Jai Courtney looks and acts nothing like Michael Biehn, making him another puzzling casting choice. Where Biehn’s Kyle Reese was a sensitive, scarred but romantic figure, Courtney is more brutish. When Kyle and Sarah get into arguments, as they often do throughout the film, it feels awfully petty instead of carrying the weight of life and death. While undoubtedly a central figure to the mythos, John Connor has never really been the most interesting character of the series. Jason Clarke is fine in the role and the major plot twist in the film (which was spoiled in the trailers and the poster) does add an interesting layer to the character, but purists will probably find it sacrilegious. Lee Byung-hun does little more than run fast and look menacing as the shape-shifting T-1000 and J. K. Simmons is entirely wasted in a throwaway bit part as the lone police officer who believes Sarah and Kyle’s far-fetched story. Doctor Who’s Matt Smith also pops up in a small but crucial role. As a standalone sci-fi action film, Terminator: Genisys has its entertaining moments and isn’t as confusing in presenting its alternate timeline plot as it could’ve been. However, it’s impossible to pretend that this film doesn’t come with more than its share of baggage and doesn’t have a towering legacy to live up to. In riffing on what James Cameron had created with the first two Terminator films, Terminator Genisys director Alan Taylor has delivered a pale imitation of a sci-fi icon, an also-rans at best. Stick around for a mid-credits sequel-bait scene. Summary:There is effort put into Terminator Genisys, but this attempt at continuing the franchise can’t help but feel it exists just for the sake of existing and is likely to alienate long-time fans of the series. 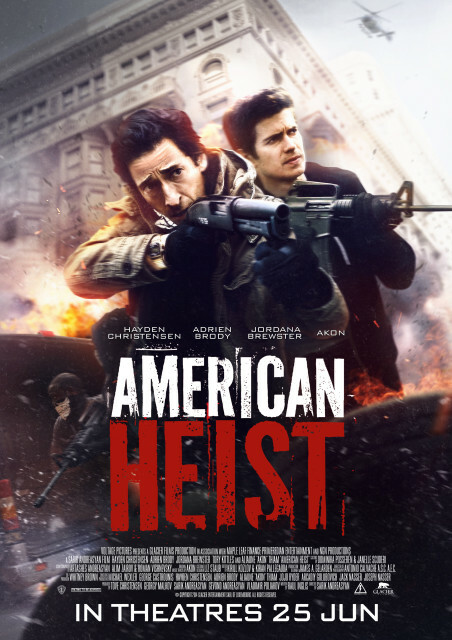 From Russia-based, Armenian director Sarik Andreasyan comes the crime thriller American Heist. 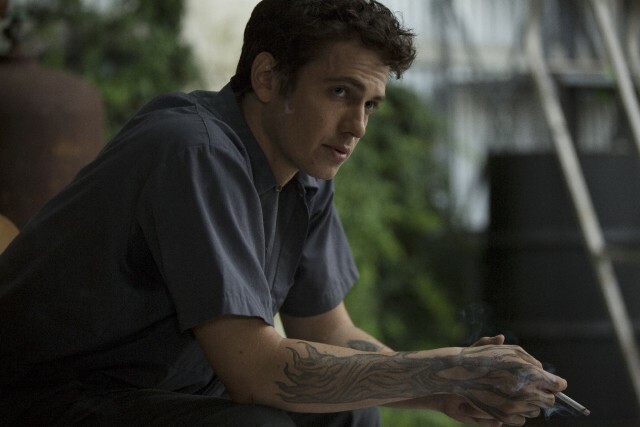 Hayden Christensen plays James Kelly, an Iraq war veteran and New Orleans mechanic whose brother Frankie (Brody) has just been released from prison. Frankie took the fall for a crime the pair committed together, serving ten years in jail. Frankie tricks his brother into joining his small gang, which also includes Ray (Kittles) and Sugar (Akon). Together, they plan to rob a bank. Complicating matters is James’ girlfriend Emily (Brewster), who just happens to work as a dispatcher at police headquarters. American Heist is supposedly an update of the 1959 film The Great St. Louis Robbery, starring Steve McQueen and in the public domain. A Russian-American co-production, this film will feel right at home lining the bottom of the bargain bin alongside direct-to-DVD dreck. The 94 minute runtime may not seem long, but this is mind-numbingly dull, the heist proper only kicking in at the 61 minute mark. This means an hour is spent doing nothing but setting up the characters, who are extremely difficult to care about regardless. Andreasyan is aiming for a grittiness in the grand tradition of American crime films like Heat and The Town, but American Heist is inauthentic and fidget-inducing at every turn. 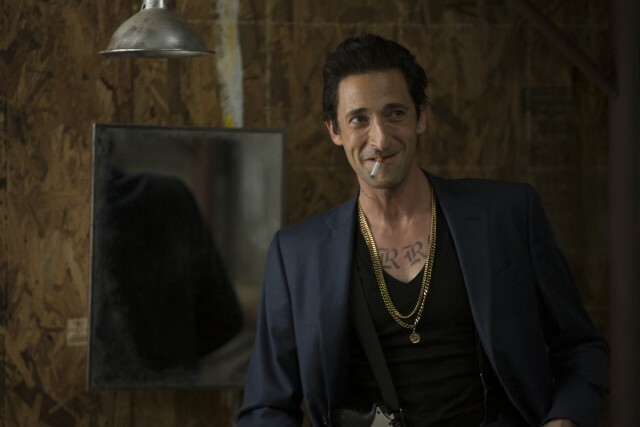 Hayden Christensen and Adrien Brody play brothers. From the word “go”, suspension of disbelief flies straight out the window. The central relationship and the tension between the brother trying to get on the straight and narrow and the other who falls back into his criminal ways upon his release from jail is nigh impossible to latch onto. Christensen, whose career was never able to fully recover following his disastrous turn as Anakin Skywalker in the Star Warsprequels, is as stilted as ever, unable to compellingly essay a downtrodden average Joe. Brody, still the poster child of the so-called “Oscar curse”, is miscast as a swaggering, tough-talking thug who’s done hard time. Apparently, awkwardly bursting into tears in the middle of heated confrontations is supposed to pass for pathos. Tory Kittles is saddled with some laughably pretentious speeches about how banking institutions are the real enemy. Akon, who plays a minor supporting role and provides the soundtrack, contributes nothing at all. It seems he is planning to encroach on 50 Cent’s “rapper attempting to act in sub-par straight-to-DVD fare” turf. 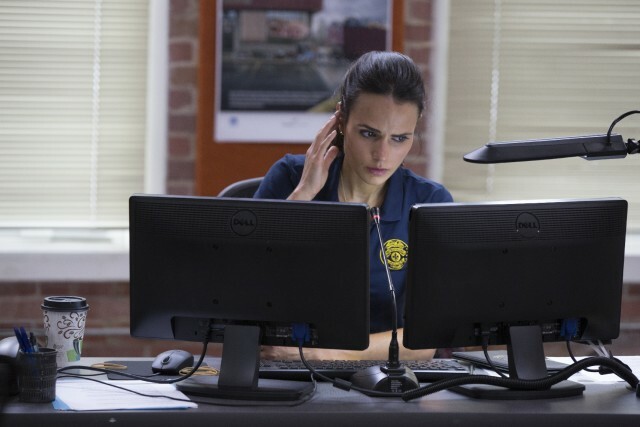 Jordana Brewster plays the bog-standard designated love interest who will eventually discover that her boyfriend is involved in some unpleasant business. 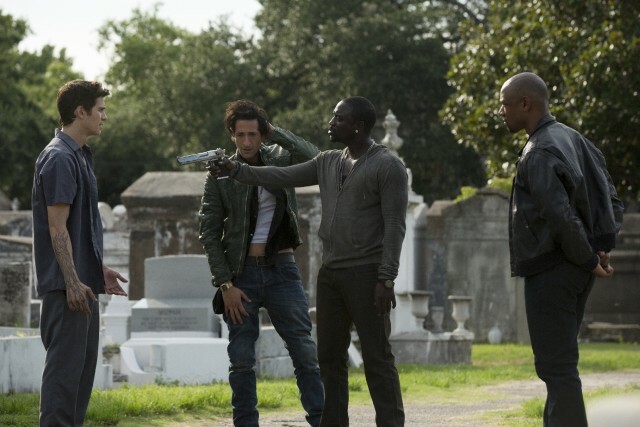 The film is competently shot by cinematographer Antonio Calvache and doesn’t look as cheap as it could have, but that’s far from enough to rescue American Heist from the doldrums it languishes in. The dramatic scenes that stretch out the first hour are plenty boring, but then the shootouts and stand-offs begin and those quickly become uninteresting too. 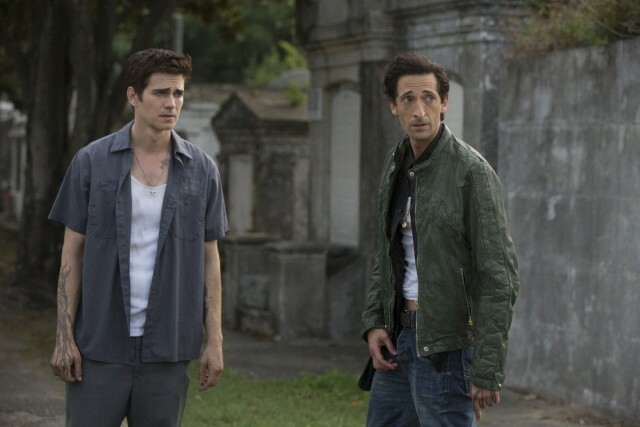 Sure to bring about spells of mass listlessness among whatever audience shows up, American Heist is uninvolving, rote and poorly acted, adding nothing at all to the crime thriller genre. Summary:This uninspired crime flick is plodding, shambling and other synonyms for “slow”. A movie with “heist” in the title should send the pulse racing instead of rendering viewers comatose. 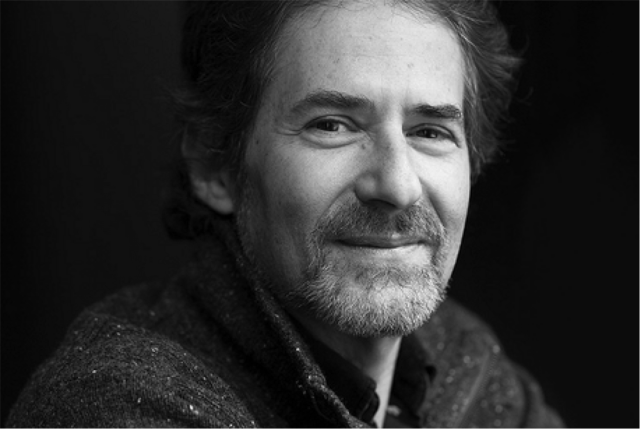 It’s a sad day for film music lovers everywhere – composer James Horner has passed away at the age of 61. An aviation enthusiast, Horner died when his personal turboprop aircraft crashed in the Los Padres National Forest in Southern California. James Horner’s illustrious film composing career has seen him collaborate with directors including James Cameron, Jean-Jacques Annaud, Walter Hill and Ron Howard. He was nominated for 10 Academy Awards, winning 2 – Best Original Score and Best Original Song (shared with lyricist Will Jennings) in 1998, both for Titanic. Horner’s credits include such memorable films as Star Trek II: The Wrath of Khan, Commando, Aliens, An American Tail, The Land Before Time, The Rocketeer, Apollo 13, Braveheart, A Beautiful Mind, Avatar and of course the afore-mentioned Titanic. While he was often criticized for borrowing passages of music from well-known works of classical pieces as well as from his own earlier work, there is no denying the impact that his work has had on the landscape of film composing. Titanic: Music from the Motion Picture sold over 30 million copies and became the highest-selling primarily orchestral film soundtrack album of all time. “My heart aches for his loved ones,” Ron Howard said on Twitter, calling Horner a “brilliant composer.” “I just can’t believe it,” fellow composer Brian Tyler wrote. Clad in blue overalls with thick goggles over their eye(s), preoccupied with bananas and spouting gibberish, the small yellow creatures known as Minions have scuttled their way into the collective popular culture consciousness. In this prequel/spin-off to the Despicable Me movies, we discover the origins of the Minions, who have been on earth since the dawn of time, drawn to evil masters whom they loyally but often ineffectively serve. It is 1968 and after a long period of unemployment, Kevin, Stuart and Bob set out to seek a new villainous employer for their clan. 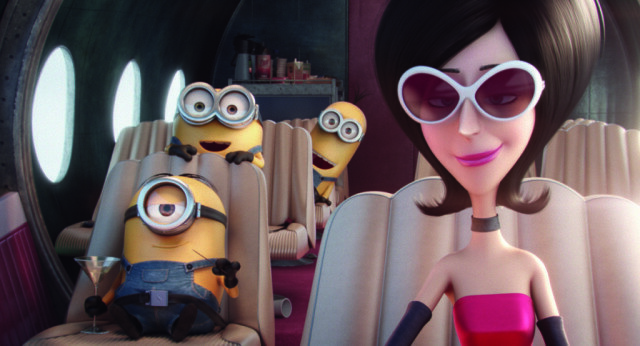 The stylish, dastardly Scarlet Overkill (Bullock) seems to be just the new boss the Minions seek. Her husband, inventor Herb (Hamm), outfits Kevin, Stuart and Bob with nifty gadgets and they are tasked to steal the Queen’s crown from the Tower of London for Scarlet, who dreams of ruling over the British Empire. Naturally, things go awry for our tiny yellow protagonists. Uh oh. It is very easy to be cynical about the existence of this spin-off film. A “minion” serves an evil overlord, who in the context of the Despicable Me series, is Steve Carell’s Gru. 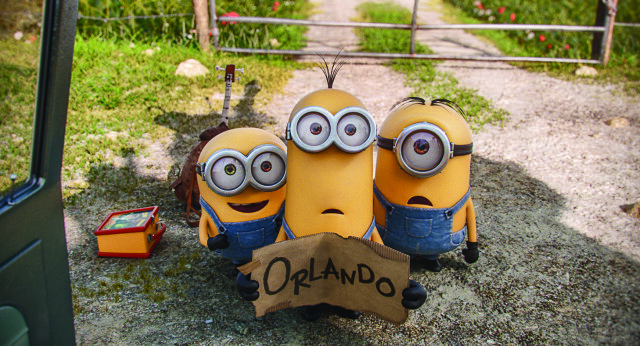 Here, the Minions, side characters by design, are given their own show to carry. There is an industry term for something with kid-targeted merchandising potential – “toyetic”. 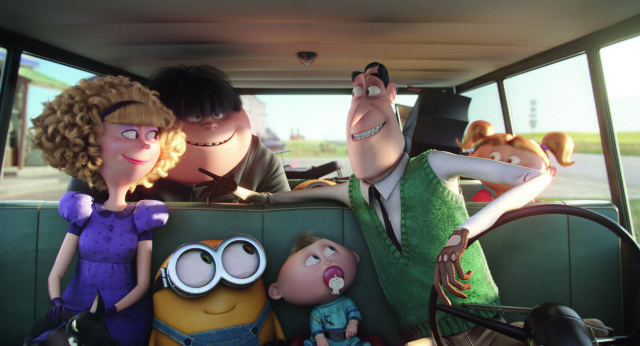 The Minions are as toyetic as they come, designed to be slapped on everything and anything that exasperated parents can fork over the cash for, with a new wave of Minion mania set to strike with the release of this movie. When McDonalds offered Minion Happy Meal toys here in Singapore, lines snaked around the block, rivalling those for Hello Kitty merchandise. It was a goofy, likeable idea to start with, but now it can’t help but feel all market tested and focus grouped out. 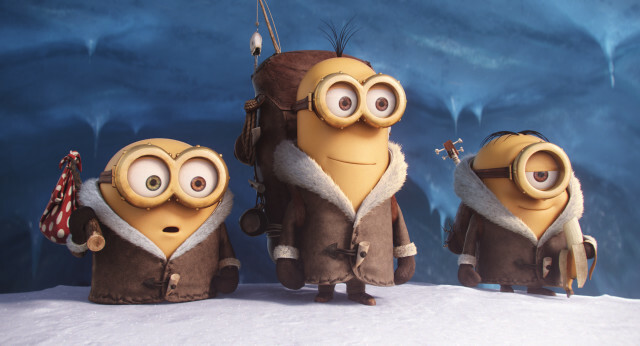 A story focusing solely on the Minions would have worked fine as a short film or as a theme park attraction – actually, those already exist, but that doesn’t diminish the shiny, lucrative appeal of a feature-length summer release. That’s essentially a roundabout way of saying that Minions has no real need to exist, which sounds like a very curmudgeon-y statement indeed now that we’ve read it out loud. For what it is, the film is harmless, often quite amusing and very competently animated. Pierre Coffin co-directed both Despicable Me films and Kyle Balda helmed three Minion-centric short films included on the Despicable Me home release. Coffin and Chris Renaud, co-director of the Despicable Me movies, voice all the Minions themselves. There are several eye-catching sequences and plenty of fun period details for the parents in the audience to grab onto – Kevin, Stuart and Bob walking beneath a giant Nixon campaign poster is a delightfully surreal image. 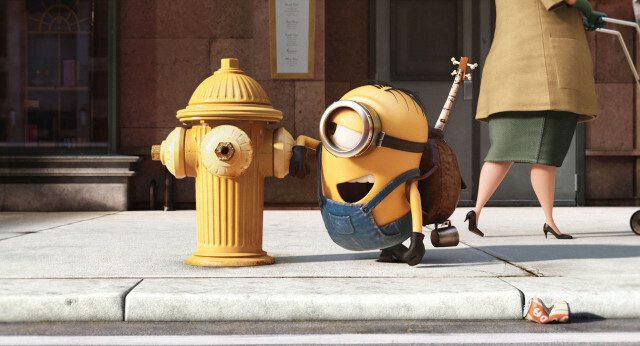 There are perhaps one too many pop culture references – for example, the Minions bumble into the Beatle’s famous Abbey Road crossing. The expected slapstick is not in short supply, but this reviewer’s favourite gag, featuring time-travelling mad scientist Dr. Flux, didn’t involve the Minions at all. 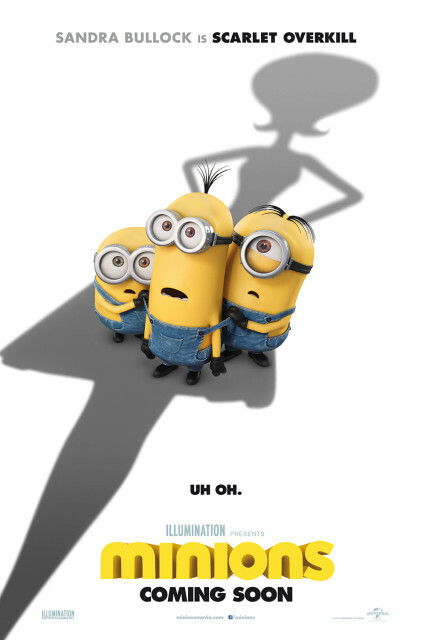 It was assumed that the Minions were the genetically-engineered creations of Gru – the short film “Orientation Day” follows a bunch of freshly-cloned Minions around Gru’s lab. The Minions’ new back-story raises very many questions. Is this one tribe the only group of Minions in existence? What implications are there in these creatures’ nature to be drawn to only the most unsavoury beings currently alive? Would they have leapt at the chance to serve, say, Adolf Hitler? It makes sense if their lives have no meaning apart from indentured servitude if they were grown that way in a lab, but these creatures are naturally occurring. We’re definitely expending too much thought on it, but these notions did prove very distracting throughout the film’s duration. Sandra Bullock is the marquee-name star chosen to headline the film as Scarlet Overkill, the super-villainess kitted out in an array of dresses that also serve as booster rockets and who’s out to prove being a flashy career criminal isn’t just a guy’s game. She’s fine, but nowhere near as charismatic and entertaining as Steve Carell before her, and it is evident that she’s not a seasoned voice actress. Playing Scarlet’s laconic husband, Jon Hamm puts more effort into transforming his voice, but it’s not an especially memorable performance. Michael Keaton and Allison Janney voice a couple who let Kevin, Stuart and Bob hitch a car ride to the villain convention; it’s little more than a cameo. It’s an animated film containing popular, easily-marketable critters and it’s being released during the summer holidays, so of course Minions is going to do well at the box office. It’s mostly pleasant enough, sometimes annoying but never outright cringe-inducing and it moves along at a decent clip. Because of the inherent simplicity of the Minions as characters and the fact that they have to carry this movie on their little yellow shoulders, this lacks the crucial emotional backbone present in the first Despicable Me film. Kevin, Stuart and Bob may be designed to be analogues for Margo, Edith and Agnes, but they just can’t replace the heart that the three girls and their emotional connection to their adoptive dad bring to the franchise. Summary: Yes, the tykes will love it and the accompanying adults might find some tidbits hidden in the 60s setting, but Minions can’t transcend its function as a cash grab vehicle. “The park is open.” With those four little words, the 14-year-long wait for a new Jurassic Park film has finally come to an end. 22 years after the events of the first film, Isla Nublar is now home to a fully functioning dinosaur theme park called “Jurassic World”, welcoming thousands of visitors each day. Billionaire Simon Masrani (Khan) has been entrusted with overseeing the park after the passing of founder John Hammond. As visitors hunger for more excitement, the park’s geneticists, led by Dr. Henry Wu (Wong), have spliced together a new hybrid dinosaur, the vicious Indominus rex. 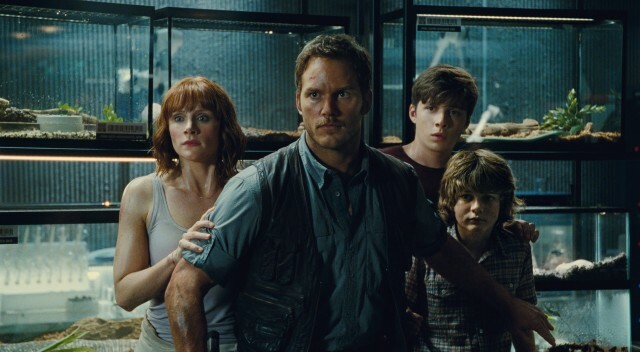 In the meantime, the park’s overworked Operations Manager Claire Dearing (Howard) is expecting her nephews Zach (Robinson) and Gray (Simpkins) who are spending the weekend at the Jurassic World resort. 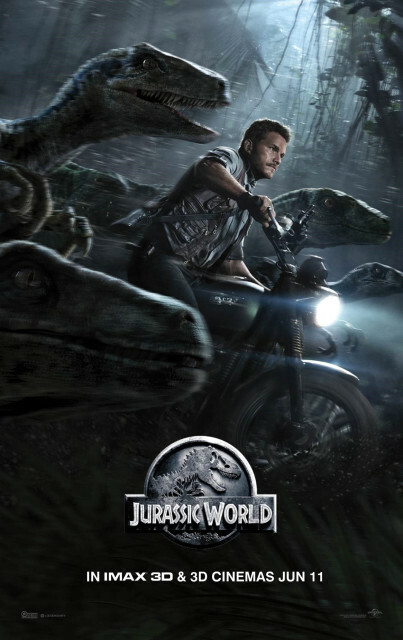 When the I. rexescapes and threatens the safety of the visitors, it is up to Velociraptor trainer Owen Grady (Pratt) and the Jurassic World security team to contain the savage behemoth. A fourth Jurassic Park film spent over a decade clawing its way out of development hell following 2001’s Jurassic Park 3. 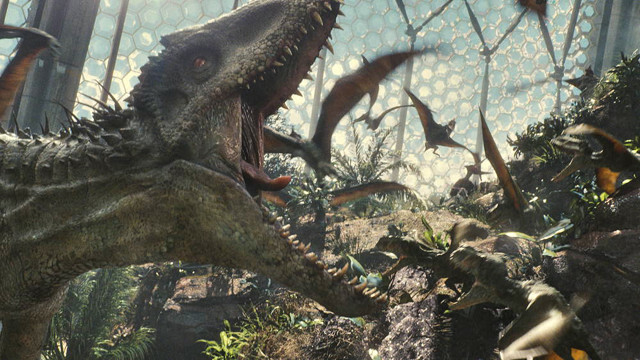 Director Colin Trevorrow, known for the indie comedy-drama Safety Not Guaranteed, was given the responsibility of breathing new life into the franchise, not unlike how InGen’s scientists bring dinosaurs back from extinction. The expectations were massive and Trevorrow’s lack of experience with big blockbusters seemed to be against him, but he has come through, not unlike the Russo brothers with Captain America: The Winter Soldier. The screenplay by Rick Jaffa, Amanda Silver, Derek Connolly and Trevorrow, contains a healthy amount of self-awareness. There are jibes at corporate sponsorship and an explanation as to the focus group origins of the name of the Indominus rex. 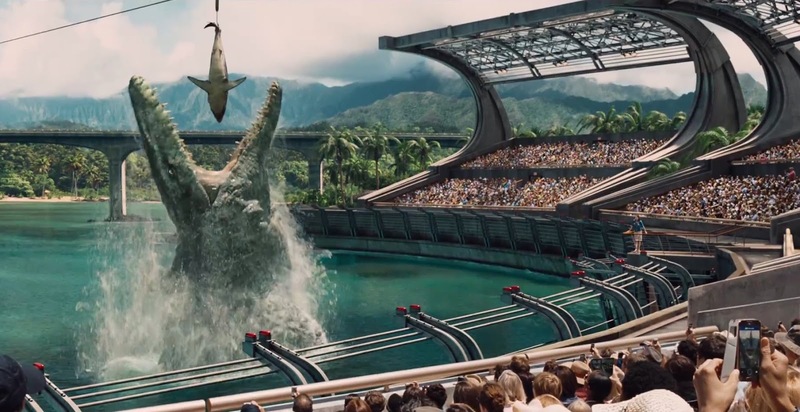 Visitors to Jurassic World have grown difficult to impress, demanding bigger, more exciting genetically-engineered attractions, not unlike moviegoers and their ever-increasing appetite for effects-laden tentpole extravaganzas. The main difference is it’s unlikely for Avengers 8 to break out of the screen and eat the audience alive. A fully-functioning dinosaur theme park seems like the natural place for a new story to unfold and, for a series ostensibly about a theme park, is long overdue. A tourist attraction at full capacity means more potential for things to go horribly, entertainingly awry. There is a lot of effort put into designing the park and the filmmakers have achieved a sense of verisimilitude with the chain restaurants, open-air arenas, monorail systems and bored employees seen in real-life theme parks. While pushing the franchise forward, there is no shortage of very respectful nods to the past and aficionados of the first Jurassic Parkmovie will find many rewarding Easter Eggs. A sequence set in the derelict visitor’s centre from the first film borders on the indulgent but this reviewer was too busy squealing with fan glee to really be bothered. A crucial element of what made the first film so enjoyable was the suspense. The classic T. rex paddock escape and the “Raptorsin the kitchen” scene were masterfully staged and dripping with tension. There are several great scenes in this movie that go for the scares and that do have that adrenaline-pumping thrill ride quality to them. 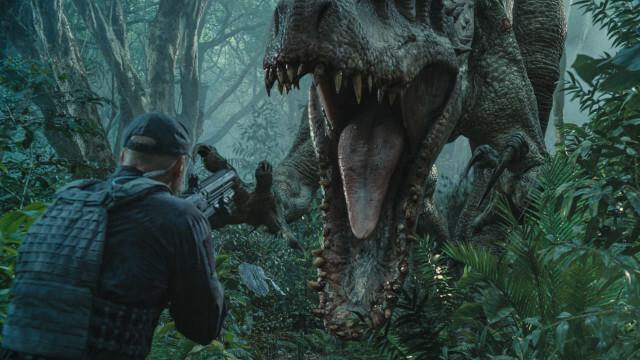 One does get a kick out of seeing the Indominus rex make quick work of heavily-armed, highly trained security contractors and a scene in which a swarm of Pterosaurs escapes their aviary to pluck hapless visitors from the park’s grounds is a wonderful “all hell breaks loose” scene of full-on panic. The Indominus rex is an appropriately formidable creature, but sometimes lacks the tactility of the T. rex in the original. There’s also that classic movie monster pitfall, where the big bad beast is so impervious to anything that it can get a little tedious trying to defeat it. Many were worried that the element of trained Velociraptors would detract from the ferocity of these iconic dinosaurs, but rest assured that they’re still unpredictable and still scary. After all, people train Rottweilers, lions and bears, with sometimes-deadly consequences. The film does slightly disappoint with some of the visual effects work – for the most part, the dinosaurs are adequately convincing, but the scene in which a sight-seeing “gyrosphere” travels amongst herds of herbivorous dinosaurs feels particularly artificial. Animatronic effects are still employed, but this one does lean far heavier on CGI than the earlier movies. The characters in this film are archetypes and are all relatively simple, but then again, so were the characters in the first movie and in this case, it’s done pretty well. 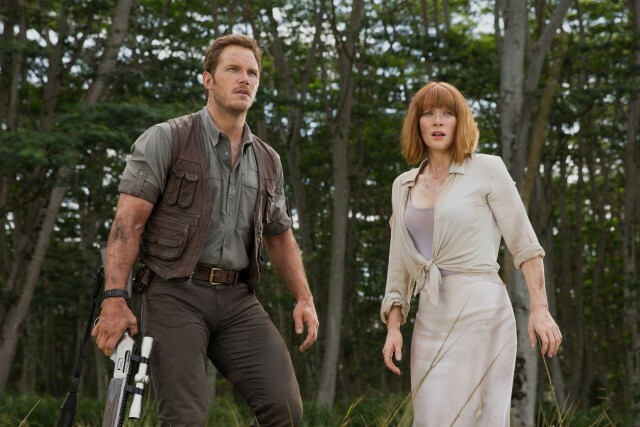 Chris Pratt further cements his A-list action star status as the rugged ex-Navy man Owen Grady, ably carrying the film as a traditional hero. 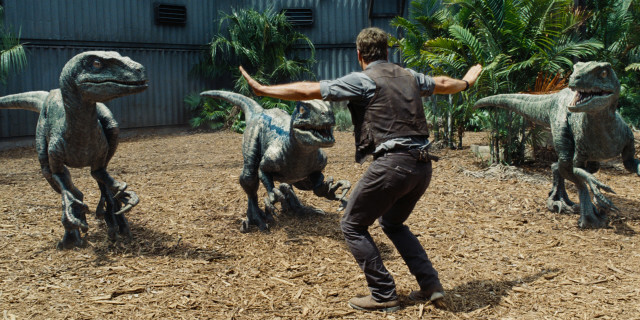 In the scenes in which Owen is interacting with the four Velociraptorsunder his charge, Pratt displays a knack for acting against nothing, perhaps a skill he honed working with Rocket and Groot in Guardians of the Galaxy. Bryce Dallas Howard plays more of a caricature, the tightly wound career woman just seconds from snapping under pressure, but it’s great that there’s a woman in charge of running things at the park this time around and we are profoundly impressed by how well she can run in heels. Vincent D’onofrio’s hard-nosed Vic Hoskins, the head of security operations for InGen, is also one-dimensional, dead set on using Velociraptors in military applications. This may be an in-joke referring to an early draft of the film, which had gun-toting human-dinosaur hybrid mercenaries. Yes, we’re glad that didn’t happen too. Irrfan Khan chews some of the lush jungle scenery as eccentric Richard Branson-wannabe Simon Masrani. 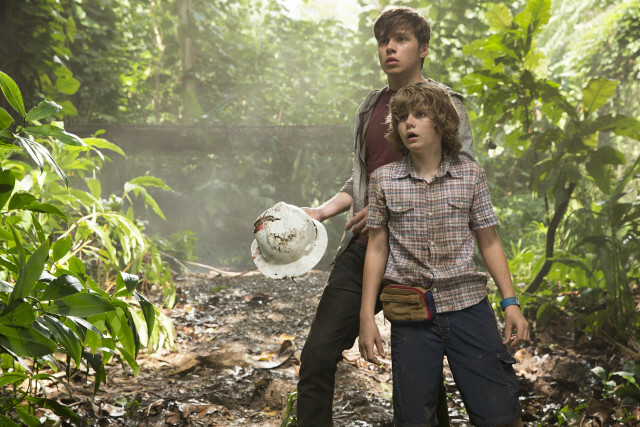 Ty Simpkins is the stock “kid in peril” and Nick Robinson is his aloof older brother – a film with as high an “embracing one’s inner child” quotient as this one has got to have kid characters in it, and they do far less shrieking than Lex and Tim did in the original. Jake Johnson’s comic relief techie Lowery gets some excellent lines and is, thankfully, not annoying. It’s also really nice to see B.D. 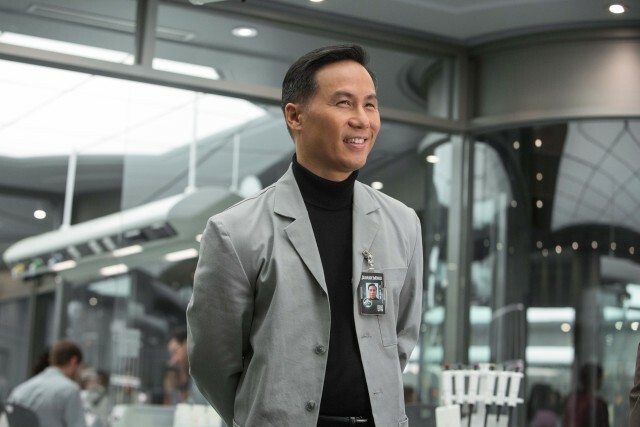 Wong again – his Dr. Henry Wu is the only returning character from the first film. Jurassic World hits all the notes expected of a Jurassic Park film without merely feeling like it’s going through the motions. It’s clear that there’s earnestness and passion behind this and that Trevorrow is a fan who wants to do right by other fans. There’s definitely a tip of the hat to Steven Spielberg and the contemporary sci-fi masterpiece that was 1993’s Jurassic Park – at the same time, there isn’t a slavishness to what has come before. If there’s anything today that could come close to inspiring the wonderment and terror that Jurassic Park did in the kids who first watched it in 1993, Jurassic Worldwould be it. Summary:Well worth the 14 year wait. A new world beckons; come on in!